If you’re looking for a December craft project that can double as a parent gift, then this project is for you! 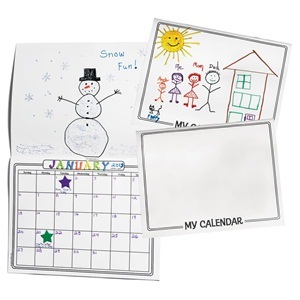 Create-It Calendars let kids design their own calendars! 12 Pages for the kids to color and decorate, plus grid lines to add your months and days. A great learning tool as you fill in the months and days – teach lessons on calendars, holidays, days of the week and counting. Create a “Dream” Calendar, with each page showing something fun or exciting they dream of doing someday. Use letters, numbers, and words to show lessons they’ve learned this year. Use fun materials to decorate the pages, glitter, stickers, yarn, foam cutouts, or wikki sticks. No matter how you and the kids choose to decorate your calendars, they will surely be a treasured gift for families.